This post is sponsored by my friends at Family Dollar. Bacon. There. I said it. Bacon. Do I have your attention? I’m so excited to share this gooey, delicious new recipe with y’all. 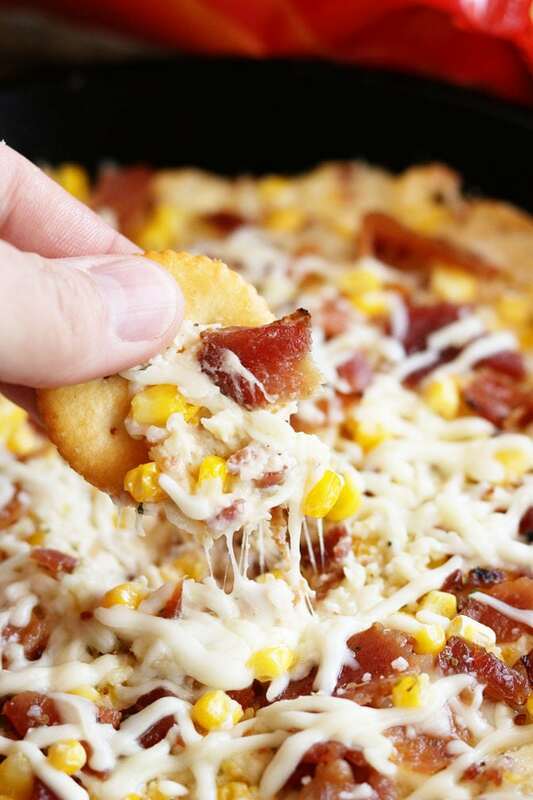 Three cheeses (cream cheese, Parmesan, and mozzarella) combine with bacon, corn, and a hint of ranch dressing mix to make this delectable warm dip that’s perfect for any cracker or chip. 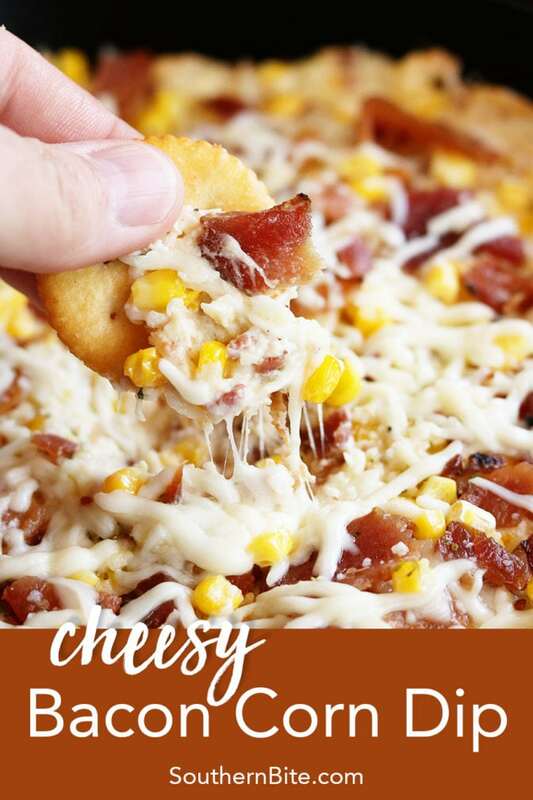 It’s so cheesy and delicious! There’s just something amazing about the combination of bacon and cream cheese. My Bacon and Cream Cheese Stuffed Mushrooms are the perfect example. 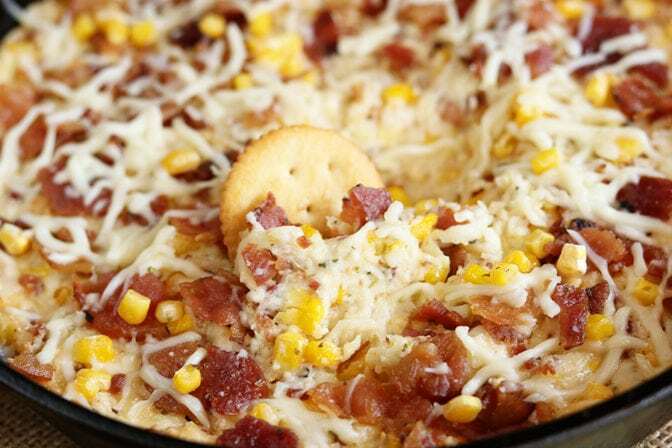 But today we’re talking about this cheesy dip. And I’m serious about any cracker or chip – corn chips, tortilla chips, thin wheat crackers, shredded wheat crackers, everything. But I especially love the buttery flavor of Ritz crackers with this. You might need to double them up to get a good scoop without breaking your cracker, but it’s worth it. And you know what makes this recipe even better? I got everything I needed for it right at my local Family Dollar. Did you know that most items in the store are less than $10? Family Dollar offers an amazing assortment for the whole family ranging from name brand foods to household cleaners, from health and beauty aids to toys, all for everyday low prices. And you can save even more by signing up for Smart Coupons. Smart Coupons is Family Dollar’s savings program. You’ll get offers that are specific to you based on the things you buy most. Head to the Smart Coupons page on the Family Dollar website to sign up and create an account. Or download the Family Dollar App from the Apple App Store or the Google Play Store. You might even find some coupons for the things you need for this very recipe. Y’all enjoy! Preheat the oven to 350°F and lightly grease an 8 to 10-inch cast iron skillet or pie plate. In a large bowl, stir together the cream cheese, ranch dressing mix, and bacon. 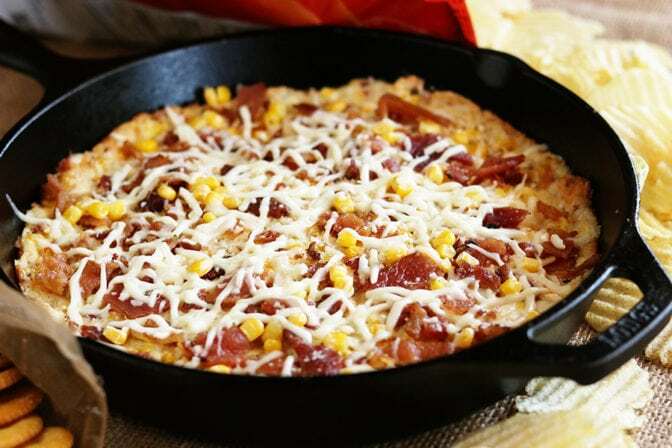 Add the Parmesan cheese, mozzarella cheese, and corn. Mix well. 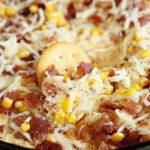 Spread the mixture in the prepared skillet and bake for 20 to 25 minutes or until bubbly. Serve warm with assorted chips and crackers. Oh, my goodness! This looks like the perfect dip to make for upcoming football Saturday’s. Thanks for the recipe. Absoutely! This is perfect football food! I couldn’t resist making this (Anything with Bacon & Cheese always gets my attention) I did, however, switch it up a bit. I made BLT’s earlier, so I had Bacon leftover. I used that in this recipe, I added a 1/2 cup Fontina Cheese, I also used a little bit of the Bacon Grease in the Skillet. 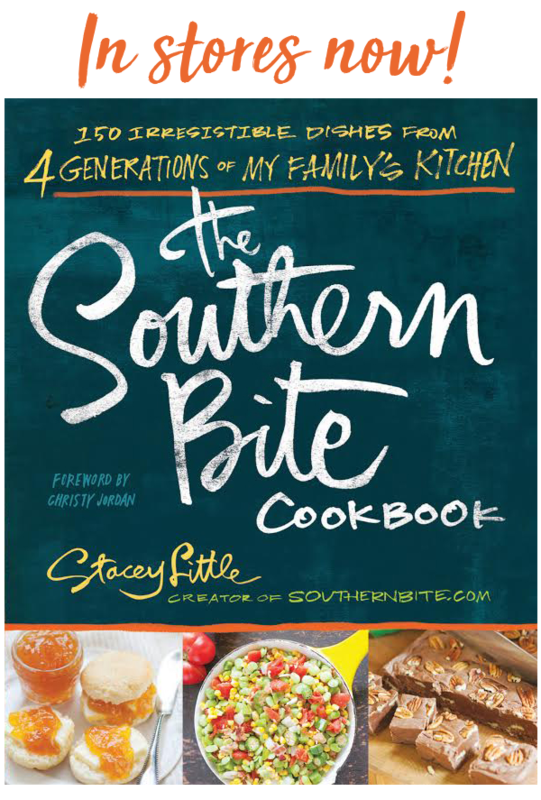 It turned out great, we were having a small get together & I was looking for a New Dip Recipe, I am so glad I found yours. Thank You for the wonderful recipe. 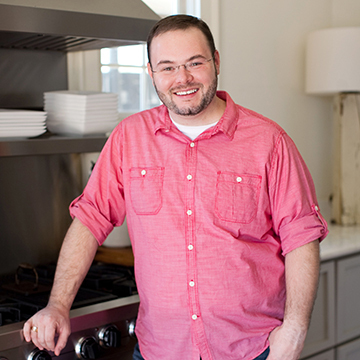 I’ll be trying many more of your Recipes. Again, many thanks, Melinda. Way to make it your own! Sound great! So glad you enjoyed it. How many slices is 2.25 oz. of bacon? 1.5? With this recipe, I just used the prepackaged, crumbled bacon (hence the measurement) but I would imagine 6 to 8 slices would work about right.